A little late this week. Thats because I had a hard time finding a potw. So last week, it was pretty cold here (well as cold as the Bay area tends to get). The snow line was down to a shocking 1500ft. So on Saturday I drove my car up to Henry Coe state park, and as I went up the mountain it started snowing. When I got to Henry Coe, the snow was coming down pretty good. I was pretty excited, not having seen actual snow since my last winter in Ontario. I tried to take pictures, but none of them turned out. 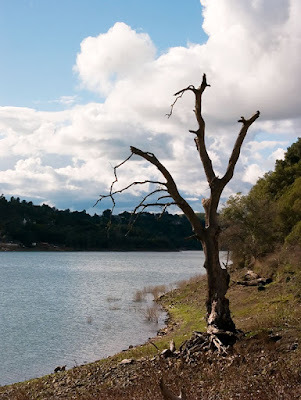 Anyway, between Henry Coe and Morgan Hill and Henry Coe lays Anderson Lake County Park. So I stopped there and took a picture of this tree, hence thats what you get for the potw. I'll have to do better next week. Technical Specs: Leica Digilux 2, 10.4mm, f/8, 1/400s, ISO 100.